Surfing and the Hand’s I noted last time, I tend to be a “jump in and learn on my own” kind of person. But since Shaun Wolden, co-founder of BigFoot Surf School down in Westport, WA had been so helpful, encouraging and supportive when my son Connor took lessons from him back in March, I overcame my historic leaning toward learning on my own and let Shaun guide me. I’m so glad I did. Shaun got me all set up with wetsuit, hood and booties (these are definitely not Hawaii-temperature waters), marched me down to the beach…and then back up to the top of the overlooking bluff. You always start, he said, by spending time understanding the water. Seeing where the waves are breaking. Identifying likely rip tides. Examining who else is out there and what they are doing. After that, we spent time on the beach learning surf safety. It wasn’t quite like watching “Red Asphalt” in driver’s ed class. But I will say that I have a much healthier respect for how the fins of a surfboard and the brute ramming force of the board itself can deconstruct or at least maim your body parts if you’re not paying attention. I then learned how to carry the board. How to appreciate the craftsmanship of the board. How to enter the water with the board. Dive under oncoming waves with the board as you make your way out. How to get on the board. Position yourself on the board. Even…eventually…stand on the board. Could I have learned to do what I did on my own? Sure. But in a lot more time and likely not as well. Plus, I would have missed out on the insights that took it from a day of fun to a truly meaningful experience. When you emerge from ducking under a wave, your immediate reaction will be to wipe your eyes. Don’t. Your head is built to deflect water. Let it do its work. If you stop to wipe your eyes right then, you’ll miss the next wave or next surfer flying right at you. Look first. Then wipe. Delayed gratification can save your life. Slow is smooth and smooth is fast. Make each movement count. Take it slow in getting everything aligned and do so smoothly. When you do it smoothly, like standing on the board, fast follows. All will be well. Look all around you. As a beginner, your natural tendency will be to focus on the board and what’s right in front of you. Don’t. Maintain a 360 degree awareness of everything: the beach before you, the surfers to your left and right, the incoming waves behind you. Don’t let your natural focus take away from a broader awareness. Great advice for surfing…and for travel. Follow the hand. OK, this one starts getting a bit surf-Zen-like. As you stand on the board, hold your left hand at eye level, palm toward the beach in the direction you want to go. Then follow the hand. (Note my left hand in the photo above at the end of the wave). Sounds a bit out there, right? But eventually I tried it. All the wobbly balance issues I’d had faded away. Fast and smooth suddenly were mine. I would never have figured out the hand trick on my own. So back on the beach later, I asked what the psychological or physiological rationale was for it. “It just works,” he said in a good-natured avoidance of my question. But he was right. Not everything requires a logical rationale. And not everything can be learned on your own. More often than we may realize, we need others to show us the way in order to get the most out of a new experience. Still, later on, I pressed again for the reason the hand trick works and got this similar answer. You can read Part 1 here if you haven’t already. Some of the challenges we see in beginner to intermediate surfers is where they are looking while riding the board – most look directly at the board! This creates a list of safety and balance related challenges, plus it’s just not how you Surf! In order to change where students are looking we have them put their forward hand up and look through the hand to where you are heading. Ever try driving a car and looking just in front of your hood instead of the road ahead, or texting and then looking up to find out you are veering off course and feeling unbalanced. Not good – Right? With surfing we want to be looking where we are going, move that hand where you want to go and your board will follow. Not perfectly for a first timer but we are teaching people how to be good surfers from Day 1. As you progress you should learn more about how hand position relates to your shoulders as you move your center of mass to make cutbacks and other moves. Also, to stay in a neutral position you should have your knees slightly bent and your elbows just above the rib cage, for smoother down weighting and up weighting of the board, especially when turning your surfboard in the direction of intended travel. 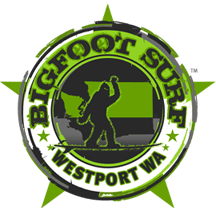 Happy and safe surf adventures – BigFoot Surf Team.